Described by Dwight Newton, Mewzilk.com organologist. Nearly all of the information on this page has been kindly provided for publication by Lon Roach of Minnesota, Sol Roach's great grandson. I am indebted to him for generously providing all of the photos and other documentary information. This page is a work in progress as Lon continues his devoted quest for information on his ancestor. If you have any questions or information to add about Sol Roach or his violins, please let us know. Lon Roach's documents suggest that Sol Roach had some kind of formal training or apprenticeship in lutherie. Roach's obituary states that he studied violin making for ten years before making his first instrument. While it's not entirely clear what this means, it seems likely that he worked with some master craftsman. possibly while he was living in Punxsutawney, in eastern Pennsylvania. There were a number of makers in the region at the time with whom Roach could conceivably have studied, but Lon Roach, who has been doing extensive research on his ancestor, has not found any definitive evidence so far to even suggest who Sol might have studied with. In any case it seems likely that his teacher was of a German or Bohemian school rather than Italian, though that has yet to be determined definitively. One curious fact that has turned up in his research is the discovery of at least two other Pennsylvania violin makers of a similar time who were also gunsmiths and locksmiths. It would seem incredible that these trades would be entirely coincidental, but there is no substantive evidence as yet to prove a relationship among these makers. Roach's personal violin, now in the possession of Lon Roach, is a unique document of the luthier's art. It was Recently worked on to repair a crack, which required removing the top. In a rare example of unequivocal documentation, Sol Roach wrote on the inside, detailing work he had done on the instrument and also the origins of the wood used and details about his varnish. Selman E. (Sol) Roach was born May 30, 1856, the third child of 11 children in the Robert H. and Sarah Singer Roach family. Sol was born in the area of Pennsylvania just southeast of Wilkes-Barrie. A family document prepared by William F. Roach (1866-1942) brother of and 9th child in the family states that Sol was born on the banks of the Lehigh River, Browntown, Luzerne County. Inside one of Sol’s violins, in his own hand, Sol states that he was born in Monroe County. Research indicates that Monroe County and Luzerne County are adjacent and that their borders are common to a length of about10 miles with the Lehigh River being the border. That 10 mile stretch is on the southeast corner of Luzerne County and northwest corner of Monroe County. The only community shown in that border area on today’s maps is Stoddardsville. Stoddardsville is divided down the center by the Lehigh River. Browntown does exist in Luzerne county but is located on the northwest side of the county on the Susquehanna River. This could be explained by the fact that early Pennsylvania towns often changed names several times and then even went out of existence when mining or timber interests failed or they were incorporated into larger expanding communities. Modern county boundaries are not necessarily the same as in pioneer days. Original counties were geographically larger and as populations developed they were carved up into smaller areas to create new counties. The 1860 Census shows the Roach family in Luzerne County, Buck Township, which is that southeast corner of the county. Father Robert is 32 and lists his occupation as a “Sawyer”. His wife Sarah is 28. The children listed are Rosebell 7, Selman 4, Sarah 3, and Martha 6mo’s. The 1870 Census shows them living in Snow Shoe, Centre County where Robert is 43, Sarah 37, Rose 17, Selman 14, Sarah 12, Amanda 8, Herminta 6, Robert 5, and William 4. Sol is listed as working in the shingle mill. It should be noted that first born child Rebecca died in 1853 at 2 years and 1 month. She was born in 1851 at the mouth of the Tobyhanna River in Carbon County, which is just south of Luzerne and west of Monroe and is the next county encountered at the west end of that 10 mile adjacency on the Lehigh. She died at Whitehaven, Luzerne County on the Lehigh River. Since Robert was listed as a sawyer and Sol as working in a shingle mill it would make sense that they would live on the river where the power would come for the mills. By this time Sol had left home. By running back time from the birthdate of his first daughter Gertrude (Nov 5, 1876) I am guessing that Sol was married to Margaret Trumble of Morrisdale in either 1873 or 74. Gertrude was their second child. There was a son, George Henry, born prior to Gertrude but a birthdate is not known for him. He died in 1884. Given Gertrude’s birthdate it is reasonable that George would have been born at the latest in 1875 and as early as 1874. If marriage and Georges’ birth took place in these years then Sol would have married at 17 or 18. His wife Margaret would have been two years younger, being born in 1858. It is also a guess that they moved around a lot during the 1870’s. Gertrude was born at Natrona Heights, Pa which is just north of Pittsburgh. There is family lore that Sol owned a shooting gallery with Buffalo Bill Cody on the boardwalk at Atlantic City, New Jersey or that Sol owned the gallery and there carried on shooting competitions with Buffalo Bill. There is a picture of the two together but no dates or other information. By 1881 Sol’s family is living at Morridale Mines where Sol is owning and running a hotel and at least two more children are born. Wilbur C. (Roxey) was born in 1882 and Georgiana was born in 1888. This 1880’s period is mentioned in a special 1900 edition of the Windber Era newspaper and the information had to have been supplied by Sol. The 1880’s suggest a bit more stability. The article gives no indication of his activities in the 1870’s. According to the Windber Era article, Sol moves to Punxsutawney, Jefferson County in 1889 where he works for the Berwind White Coal Company. Research at the Coal Heritage Museum in Windber shows that all employee records prior to 1922 had been destroyed, either by miners or by the company, during a period of labor strife in that year. Sol’s obituary states that he killed nearly 300 deer and over 40 bear in the Pennsylvania woods in his lifetime and that he had made part of his living hunting and trapping while wild animal furs brought good prices. This large number could indicate that he was working for the coal company as a professional hunter. This notion was agreeable to Russel Harriger, author of Long Rifles of Pennsylvania, a history of rifle manufacture in Jefferson and Clarion Counties. 1889 was also the year of his daughter Mary’s (Mayse) birth either in Morrisdale or Punxsutawney. Sol moved to Windber in 1898 and was one of the first businesses to locate on the main street at 1101 Graham Ave. where he ran a gun and bicycle store. The actual reason for this move is not known but can be assumed from the following statements from Paul Alcamo’s book The Windber Story. Sol’s last child Bernice was born in Windber in 1901. The period of the 1890’s is of particular interest because it is likely the period where he is learning gunsmithing and violin making. There is no record of where Sol learned either of these skills. 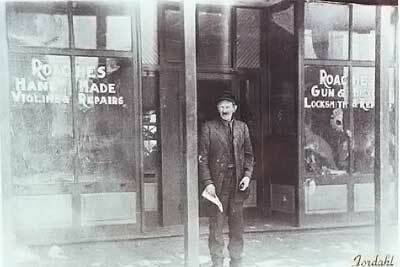 It seems though, that gunsmithing and gun building were to some degree a tradition in the family. There is an 1873 letter to Sol’s father Robert from Robert’s brother Samuel regarding a gun that Samuel had made for him. Correspondence indicates other references to guns made by Samuel. Samuel is buried at Brisbin southwest of Philipsburg, Clearfield County. The 1880 Census shows the Robert Roaches living at North Houtzdale. Brisbin is just to the north of modern Houtzdale. When Sol arrives at Windber in 1898 (Windber History book) he is listed as one of Windber’s first businessmen with a newly constructed store on the main street, Graham Ave. He is running a gun and bicycle shop and hiring out as a guide. No mention of violins yet. While in Punxsutawney during the 1890’s though he is only 17 miles from two known violin makers. These two violin makers were located in Brookville, just 17 miles northwest of Punxsutawney and both were also well known gunsmiths. According to modern indices these are the only two known violin makers anywhere in that part of Pennsylvania in that time period. They were Henry Bonnet and Daniel Long. Long and Bonnet were both about 20 years older than Sol. According to Harriger’s book Long Rifles of Pennsylvania, by 1895 Bonnet was no longer listing himself as a gunsmith and was concentrating on the making of violins. The services and goods sold in Sol’s Windber shop by the 1910’s is nearly the same as that advertised in Bonnets shop in Brookville years before: guns, bicycles, violins and fishing tackle. The similarities between these men and their businesses can hardly be coincidental. However, I have been unable to directly connect these men. A further mystery emerges concerning where Bonnet and Long learned violin making. Neither left Jefferson and Clarion counties for any period of time in their adult lives. Their gunsmithing mentors are well known but it’s not known from whom they learned the to make violins. There is the possibility of an additional maker somewhere in the region who remains unknown. There is more coincidental evidence that Sol, Bonnet and Long might have known each other. According to Harriger’s book, a newspaper account from 1920 says that Daniel Long “…felt that he must beat the famous gunmakers of the day in building a target rifle which should outshoot in distance and accuracy any gun yet produced”. “Having constructed the greatest gun of his day, our genius turned his wonderful brain to the manufacture of violins…”. As a professional hunter and trapper Sol would also have known of the legendary Long family “…portrayed by numerous historians as the greatest subsistence hunters in western Pennsylvania.” One of Long’s brothers, William, was known as the legendary “King Hunter”. Long’s uncle, William McCullough, with whom Long grew up, was also a gunsmith, teaching the skill to Daniel and was also a famous hunter and marksman in the area. Sol was at one time state marksmanship champion in rifle shooting. According to his grandson John Roach his accuracy as a shooter was legendary and that he would typically use a squirrel round like the 25-20 to take dear using one shot. Competitive shooters living so close together would surely have known of each other but the evidence is only circumstantial. Sol’s obituary states that he studied violin making for 10 years before he made his first violin. It does not indicate with whom he studied or how he went about it. Being employed by a coal company or running his own business would probably preclude an apprenticeship in a luthier’s shop. According to Harriger’s book and a direct relative of Henry Bonnet, Bonnet never had an apprentice in his shop. The earliest example of Sol’s work that we know of is from 1907. However his trade listed in 1900 does not mention violins, where by 1915 it is plainly pictured on his shop window. That would make the 1890’s or early 1900’s the period of learning. The 1907 violin is well made and does not look like a first effort. The builders tag on the inside of the violin is commercially printed and says that it is made of wood from 1720. The 1720 is crossed out in pen and 1650 is written next to it. This would indicate that he was making violins prior to 1907 with wood from the 1700’s with the confidence to have commercially printed tags made up. However in 1907 he had available to him wood from the 1600’s which he duly noted. That puts the beginning of his violin making sometime prior to 1907. The fact that it does not appear on his shop window in 1900 or is mentioned as a trade only means that he hadn’t advanced to where he was confident in his craft or that it simply wasn’t called for in a newly opened coal mining town, which had to have a frontier flavor to it at that time. The 1907 violin was made for Sol’s first grandchild by his oldest daughter Gertrude. It is not a full size violin and has a petite feel to the neck. It’s owner, Selman J. Morgan died at age 7 in 1909 of Bright’s disease as the result of “Scarletina”. The violin remained with the Morgans being used by Selman’s brother Dwight but eventually came back to Sol who took it as his own personal violin. 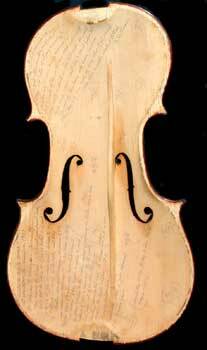 In 1914 he took the violin apart to regraduate it and at that time wrote extensively on the underside of the top board providing the following information. He also placed his photograph on the back of the violin. Sol played for square dances and country picnics. It is surprising that he would use this violin since his physical stature would appear to be large. A photo of Sol with others shows that he is a tall man and that his hand was large with broad fingers. The bridge found on this violin was original and signed and dated by him and it is quite flat, as favored by fiddlers for harmony playing. Its smaller size would limit its volume in the days of no amplification. A larger fiddle probably would have served him better. However, I have determined that Sol had a sentimental streak in him. This violin was made for his first grandchild. Sol made violins for three of his five living children. He also made a violin for his grandson John Roach, when John was only three (1911)! John, along with his sister Margaret, was raised by Sol and Margaret when their mother, and wife of Sol’s son Wilbur, died in 1909. Wilbur was a professional baseball player at the time and was gone a good part of the year. Although he remarried in 1911 and lived just two doors from Sol’s home, the children of Wilbur’s first wife remained with Sol and Margaret. It can be inferred from the notations inside Sol’s eight known violins that Sol’s construction concepts and tonal concepts were always subject to improvement. The 1907, 1911 and 1924 violins all have visually different profiles and different measurable dimensions. The three 1924 violins are visually similar in appearance. Early violins that were still in family possession were regraduated at a later date to reflect what he considered improvements in tonal concept. The violins that still had their original bridges (on family violins the bridges were marked with the date of construction and who they were built for) were outfitted with bridges that were quite flat across the G, D and A strings, in keeping with country fiddle practices. The bows in the cases were all of the three instruments that were family owned instruments were all of a much lighter weight construction than is typical today. It is unclear just how many violins Sol actually made. The material provided by his children for his obituary states that he had made about 50 original violins with about 15 being sold. However, by his own hand inside the 1907 violin, Sol states that as of 1914 he had made “close to 200” violins and that would be the midpoint of his career as a luthier. A telephone discussion with a Johnstown area repairman about Roach violins he has repaired indicate that Sol was known for his ability to graduate instruments. Two of the three Roach violins in the Windber Museum appear to be such instruments. These instruments appear to be massed produced violins and clearly show the stamp of the original maker but also have one of Sol’s tags glued inside under the “F” hole. Sol may have generalized and considered these instruments as a part of his work. I have also been unable to locate the “violin maker academy” in New York as mentioned inside the 1907 violin. The obituary states that he had a collection of stringed instruments “containing many masterpieces”. According to his grandson John Roach who was away at college at the time, this collection, along with an extensive collection of antique firearms, was sold off by the family at the time of Sol’s death. They retained little or nothing. It is recorded in The Windber Story (pg 290) that Sol made violins for Henry Ford. This assertion cannot be confirmed at this time. However, his obituary states that he was a friend of many men high in Pennsylvania politics and, as a hunting and fishing guide, had escorted many “distinguished personages”. 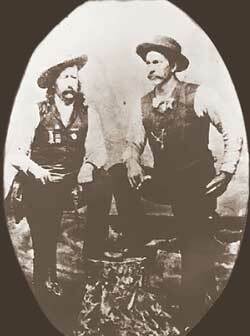 His friendship with Buffalo Bill could also have been his introduction to Henry Ford. Sol passed away on January 1, 1933 as the result of a self-inflicted gunshot wound to the head. The newspaper obituary states that he was disconsolate over failing health and the death of his wife in 1931. He is buried in the Richland Cemetery (located off Rt. 56 and 219 between Johnstown and Windber) along with his wife Margaret and daughters Gertrude and Georgeana and their husbands.